← Walnuts cake with ricotta, mascarpone and pears. Puff pastry is easy! Step by step. 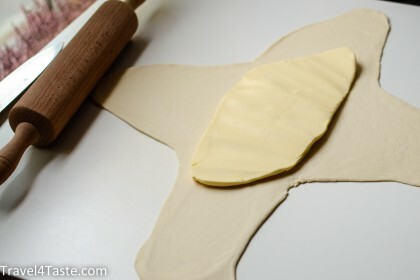 It took me quite a while before I got a courage to look up a recipe for the Puff Pastry. I was sure it has to be difficult to create such a light, layered pastry. I was really surprised when I realised how easy it actually is! Although it takes quite a while to prepare it (around 2h), a good thing is that you can prepare a bigger portion and then store it in your freezer (up to one month). 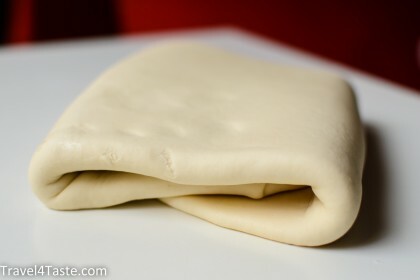 Big part of French confectionery is made of this puffy pastry. Croissants and pains au chocolat are very popular on French breakfast tables. But there are also some more fancy ways to use Puff Pastry. You could decorate it with delicious cream and raspberries or make them savoury by stuffing it with spicy vegetables and cheese. Respecting the cooling time between folding & rolling steps is important! 1. 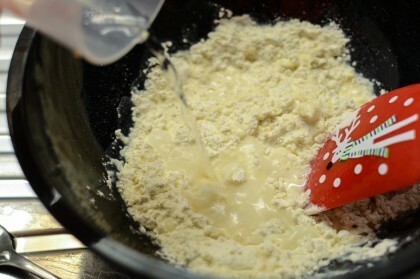 Mix together flour, salt and water. Careful, you mustn’t warm up the dough with your hands. 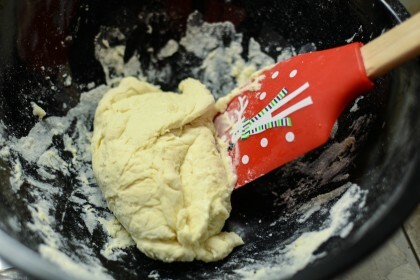 In order to knead the dough use first a spoon, then just your finger tips. Leave the butter in the fridge until the last moment. 2. 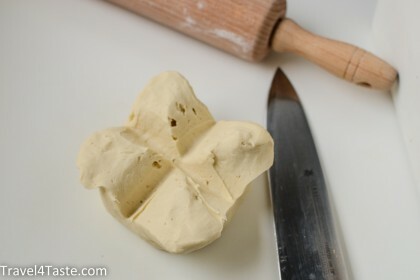 Form a ball with the dough and with sharp knife cut a cross in the middle. 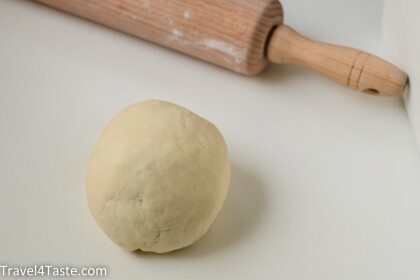 Roll the dough in a shape of the “+” sign (see pictures below). 3. Now you can put butter out of the fridge. Place it between two sheets of backing paper and beat it well! You can use your rolling pin. From being a rectangle it needs to became a 1cm-thick circle. 4. Now turn the dough wrapping the butter on the other side (so the opening of the dough is on the bottom) and gently, roll it into a long thin layer. Fold it into three (this creates the layers in the puff pastry. Each layer is separated by a thin butter sheet). After folding put it directly to the freezer for 10 minutes. 5. 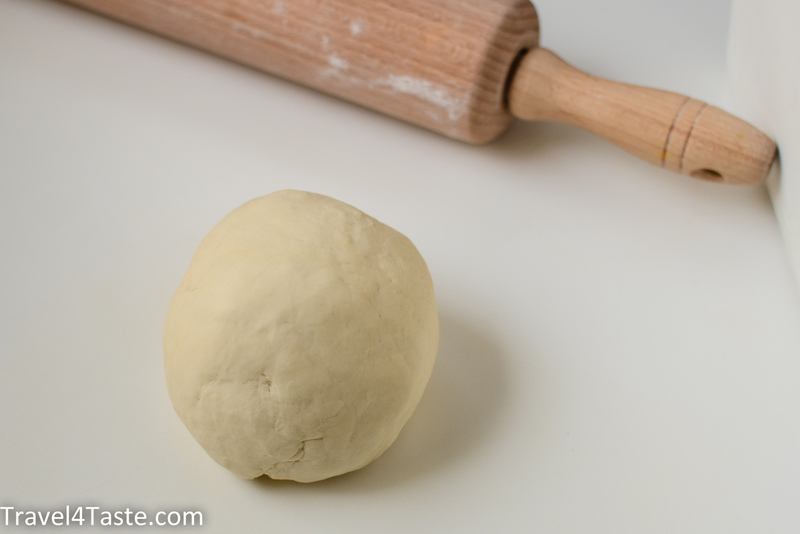 After cooling down step, take the dough out and again roll it into a long thin layer. repeat the folding stage. And again put it into freezer to cool down for another 10min. Repeat rolling, folding and cooling in total 6 times. 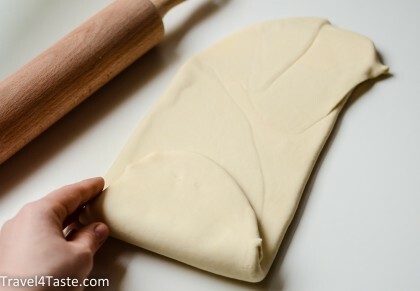 Your puff pastry is ready ♥ You can use it directly (keep in the fridge until last moment before baking). Or freeze it to use another day. This entry was posted in B-Day, Christmas, Dessert, Easter, France, Valentine's Day and tagged c. Bookmark the permalink. 3 Responses to Puff pastry is easy! Step by step. 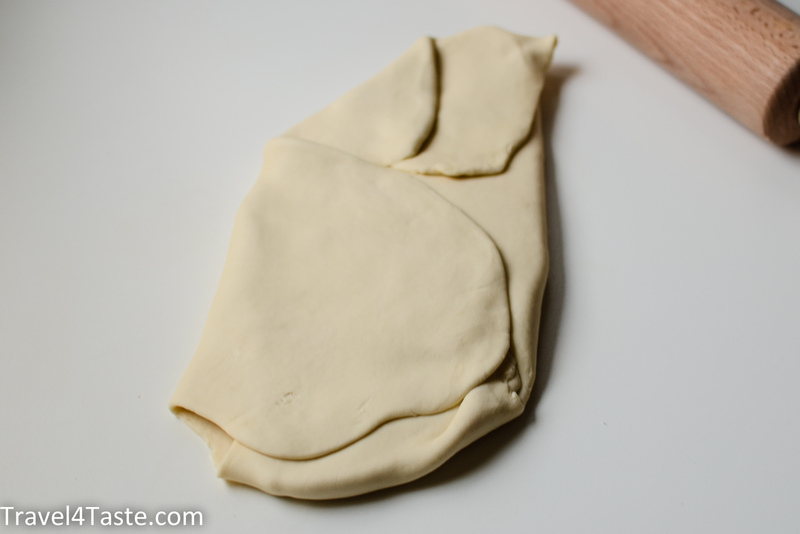 Firstly, a big thanks to this easy from scratch recipe for making puff pastry. I’ve tried quite a few long and tedious recipes, but with not so good results. I have already used this recipe twice- once for making palmiers and another time for apple tarte tatin. Worked out really great every time. I wonder if you could also put out a step by step picture recipe for making paczek(or paczki?)? ?